In soft ground, there are three main types of TBMs: Earth Pressure Balance Machines (EPB), Slurry Shield (SS) and open-face type. 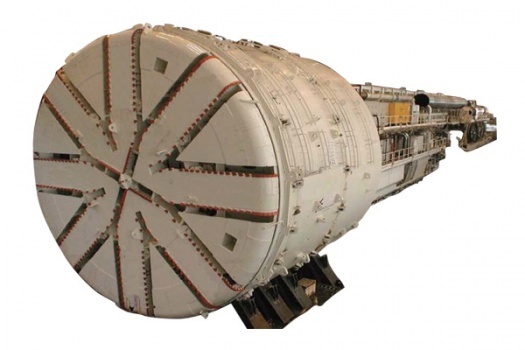 Both types of closed machines operate like Single Shield TBMs, using thrust cylinders to advance forward by pushing off against concrete segments. Earth Pressure Balance Machines are used in soft ground with less than 7 bar of pressure. The cutter head does not use disc cutters only, but instead a combination of tungsten carbide cutting bits, carbide disc cutters, drag picks and/or hard rock disc cutters. The EPB gets its name because it uses the excavated material to balance the pressure at the tunnel face. Pressure is maintained in the cutterhead by controlling the rate of extraction of spoil through the Archimedes screw and the advance rate. Additives such as bentonite, polymers and foam can be injected ahead of the face to increase the stability of the ground. Additives can also be injected in the cutterhead/extraction screw to ensure that the spoil remains sufficiently cohesive to form a plug in the Archimedes screw to maintain pressure in the cutterhead and restrict water flowing through.